Hi guys! Happy Monday! Got a couple of cards to share made for Really Reasonable Ribbon. Winking owls and wide eyed jack o lanterns....it's all good! I used burnt rust seam binding. and a little bit of black licorice twine. Added in my buttons and layers using 3d foam tabs for dimension. And that was that....what do you think? Hello peeps.....got a fun Petaloo project for ya! This month we focused on things you can do with your Children this Summer. I thought why not a sewing project? A simple starter to break them in with the sewing skills. I created a little pincushion to put my vintage hat pins on. Start off with cutting some corresponding fabrics 6 x 6, making room for a seam allowance. Face right sides together and pin. Sew all the way around the edges but leave a small opening for filling the pincushion with fiberfill. Turn the right side out and fill it and than give it a simple whip stitch to close the hole. Add some fun ribbons and start adding your Petaloo blooms. Hi guys! Happy Saturday! I have a post up over at RRR. Just a little card. I couldn't wait any longer and had to create something for Halloween. I used the purple satin from this month's ribbon club. It makes a gorgeous bow. I added Petaloo blooms, a fussy cut image from Graphic 45, and Crate papers. Hellllllllo peeps! Time to partayyyy with RRR! 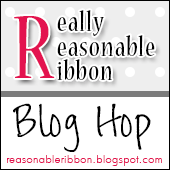 It is blog hop time! You should have found your way here from Deborah's blog. This month's ribbons are oh so pretty in pink and purple! Take a look! I love that lattice ribbon! I decided to use the purples in the collection to create this sweet card. I paired it with some gorgeous blooms from Petaloo. I love using black with purple for the graphic quality it adds. I used an old illustration from a book and a cute sentiment from Lori Hairston's blog. Happy post 4th ya'll! Sharing a sweet little card made for RRR. Love this grosgrain ribbon ribbon in Circus dots...makes the best bows! and it is all about the kittahs???? right? A cutie little flair from Lori...along with gorgeous Cosmo Daisies! ey there! Cherry here today to share another fun kid's project. Dare I say a very feminine girly project. Darling little vintage style button cards using all the gorgeous Petaloo blooms. Yipppppeeee! I so hope I have a granddaughter some day so I can do these types of projects with her! These especially remind me of my mama...she loved to sew, so these are very special to me! So first off...lets grab oooodles of our Petaloo blooms, cardstock, ink, and some stamps. Lots of ribbons too....you always have to have ribbons. ribbons and flowers are like PP and J.....you can't have one with out the other. I cut my card stock into different fun shapes. I even used my teeny tiny diecut that makes the button cards look more legit with a hole at the top to hang. Grab some fun stamps and just have fun with this part....creating the way you want your "vintage button cards" to look! From here ....I am like a kid in a candy store but with flowers.....these are what make these little button cards come alive. Look how gorgeous the Botanica collection looks.....they look old fashion to me like they are old milinary flowers pulled from an old hat. So hope you like.....thanks for visiting! Hello folks, Cherry here today with a pinwheel tutorial! The design team was challenged to come up with some projects that we could do with the kids. My "kid" just graduated and he is a boy, so I thought I would take on some more girly projects that would be fun to do. I have a quick tutorial to share in case you would like to make some with "the littles" this Summer. First grab your flowers and fun papers and let's play! Next mark your papers 4 inch x 4 inch and cut using your paper cutter. Remember it is important to like both sides of each pinwheel...you will see both patterns. I usually like to come up with my own double pattern papers so I cut two pieces for each pinwheel and adhere together. I use mini clothespins to make sure they adhere together well. Next just simply cut each corner with scissors in about 2 inches....I never measure. I just wing it! From here just fold over every other corner. You will start to see the pinwheel shape. Here they are....pretty cute huh? To secure them I use a diecut circle and adhere down and I also back them with one to make them more sturdy. Now it if time to have fun layering them up! Kids can really have fun adding all kinds of goodies.....paper scraps, ribbons, buttons, and of course flowers! I added ribbons, layers, and mini clothespins that were topped off with the perfect touch...mini butterflies and the sweet petites! Don't forget to add a dowel or straw to the back!! New challenge up at RRR! July 1st???? What??? Say it ain't so. All I know is once the 4th hits Summer goes by at super sonic speeds. Me do not likey this at all! What I do like though are new challenges at RRR. It is a flower challenge with ribbons. Use the flowers girlies! So easy and fun to do. Here is my take on it. Is this not the sweetest pink seam binding bow ever? I love when they turn out like this...I used baby pink seam binding. What about this sweet image from over at Lori's blog. She is always so kind to share her finds! I ended up pairing it with a cute flair pin I bought from her shop. I used it on this sweet pinwheel.